The All Progressives Congress (APC) National Working Committee (NWC) led by the National Chairman, H.E. Comrade Adams Oshiomhole met with the Party’s House of Representatives Caucus led by the Majority Leader, Hon. Femi Gbajabiamila at the Party's National Secretariat in Abuja on Thursday. The All Progressives Congress (APC) National Working Committee (NWC) led by the National Chairman, H.E. Comrade Adams Oshiomhole met with the Party’s House of Representatives Caucus led by the Majority Leader, Hon. 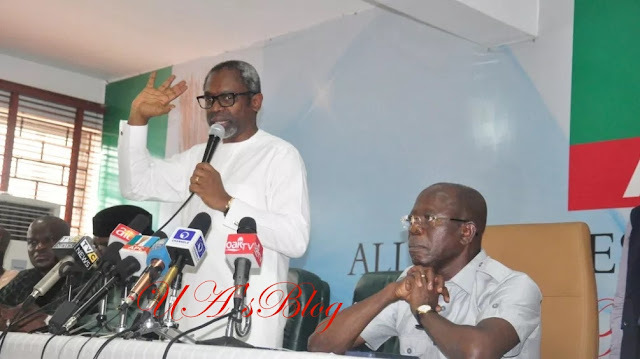 Femi Gbajabiamila at the Party’s National Secretariat in Abuja on Thursday.